This is the first time to be in Tanzania in May. The continual heavy rains in April have “greened” the normally red dusty clay fields with crops of maize and beans, making farmers happy. The air is sweet and humid. And surprisingly, I found the temperature to be quite cool, similar to our Victoria spring. 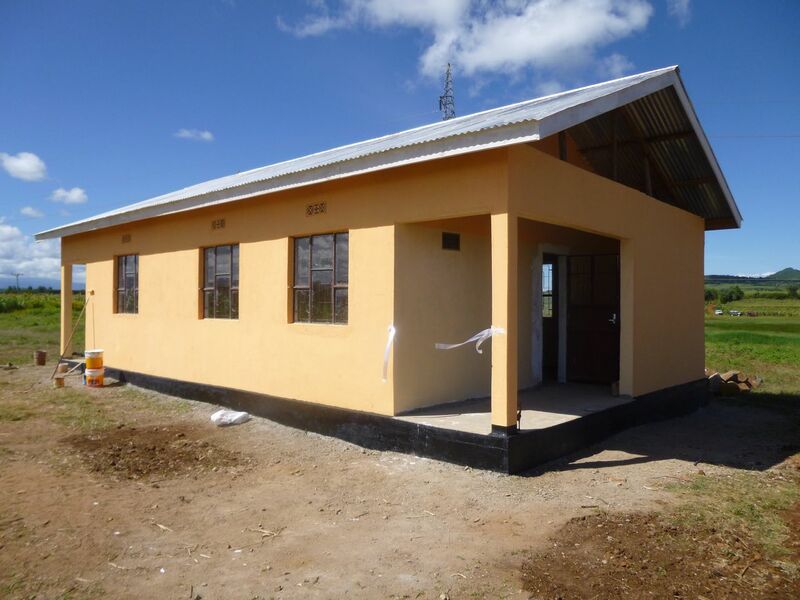 The two projects under construction were nearing completion despite a month of heavy rains in April that continued into May up until a few days ago. Arriving at the Gongali site on Wednesday afternoon, the road was cut off several hundred meters short of the school by a large pond of water. To get around it we trekked through a maize crop on one side, bobbing and weaving our way through the dense harvest-ready 8 foot high maize stalks, at times up to our ankles in mud. Waiting for us at the new Teacher Residence building was builder Phabian Ammas, always smiling and anxious to show his team’s work. We were very impressed with the quality of work. The only job remaining was the painting that would be done as soon as the building dried out under the welcoming sun. Three classes were in progress, including a preschool one. The kids sang a wonderful welcome as we visited each class in turn. This is always the highlight of our visits. Teachers Sarah Mollel and Medard John introduced me to the new teacher, Mr Mollel (no relation to Sarah), a young single man who’s enjoying his new home in one of the residences. Sarah and Medard joked about his wish to be married soon to share it with a family. Life at the site has improved somewhat since my previous visit where, if you recall, water supply was the issue. Sarah’s garden then was in danger of drying out, ruining her vegetable crop. (It did barely survive). 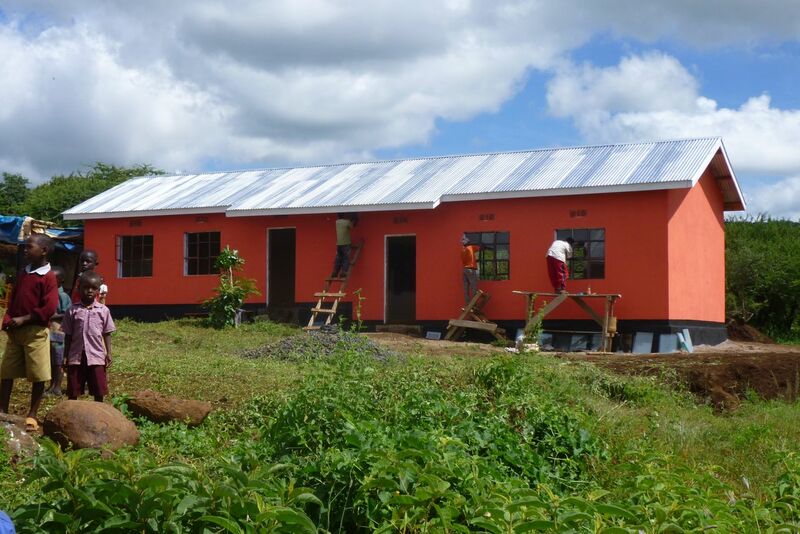 Since then we completed a project to add roof rainwater collection to the residences and the kitchen. At her new tank installation, Sarah happily rapped against its filled walls to prove its success. We included piped water supply to a public tap point in the project, but the final connection was stalled by some Water Department red tape. I would contact Mayor Peter Hayshi and District Chairman Lazaro for an answer to the holdup. 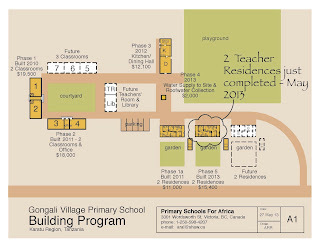 The village had planted a healthy crop of maize on the school site, but food for the children would continue in short supply until it would be harvested. On Thursday morning, Mathew and I accompanied District Chairman Lazaro Titus to our next project school site at the village of Ayalabe, where we agreed to build the first two classrooms starting in June this year. Lazaro had already organized the leveling of the sloped land using contracted grader vehicles, making it easy to build on, and was in the process of getting villagers to collect stones for the foundations. 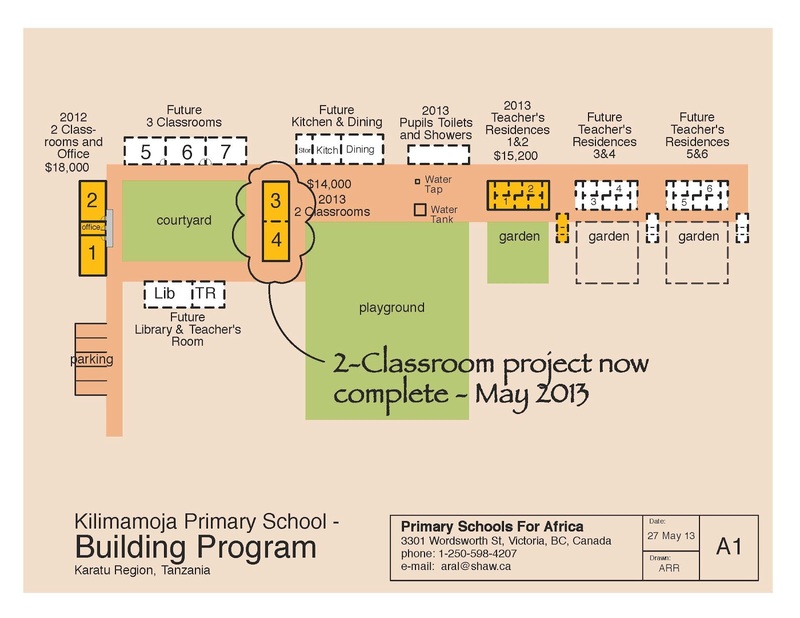 This will be a joint project; we fund and build the classrooms and the District the first two Teacher Residences. We spent an hour or so discussing the layout of the buildings to mutual satisfaction. In the afternoon, we visited the Kilimamoja site to inspect the new building for Classrooms 3 and 4. It’s been two days since the rains have stopped and to my great relief, the sunshine was enough to make the roads passable. As at Gongali, the final painting was on hold until the concrete bricks on the walls dried out. Phabian did a good job of “stepping” the building to allow for the sloped land. We will return next week for the official opening of both buildings. 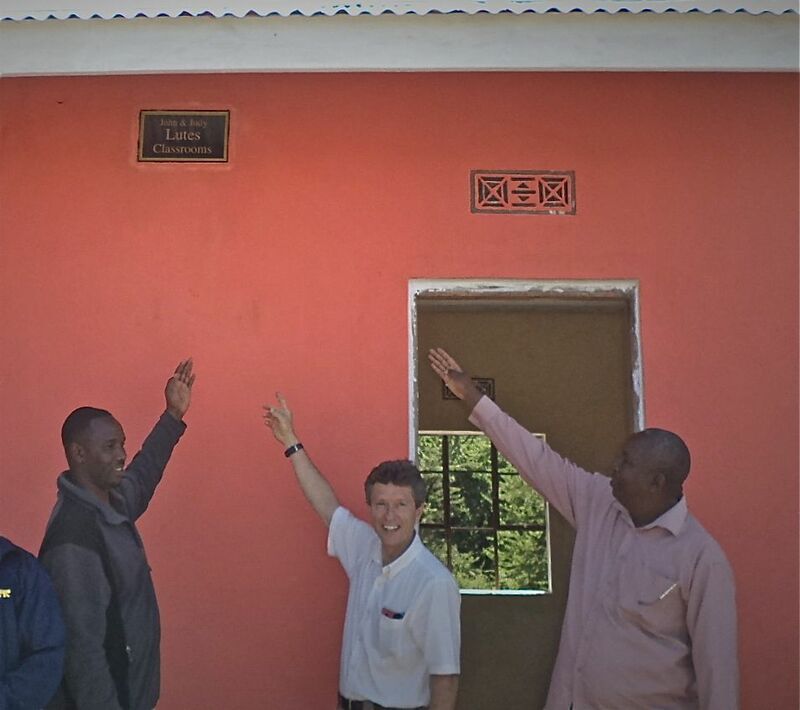 Today was the official opening of the new Teacher Residences at Gongali School. Access to the site was still hampered by the pond of water that cut off the road, but fortunately this week the mud had dried out somewhat, so the approach trek through the adjacent maize crops was a lot easier. District Chairman Lazarus Titus, Mayor Peter Hayshi and District Education Officer Kinyemi Sepeku greeted us and ushered us to the Dining Hall where teacher Sarah Mollel delivered her midyear report on the school’s operation. The highlighted issues were the delayed food program and the lack of school supplies. 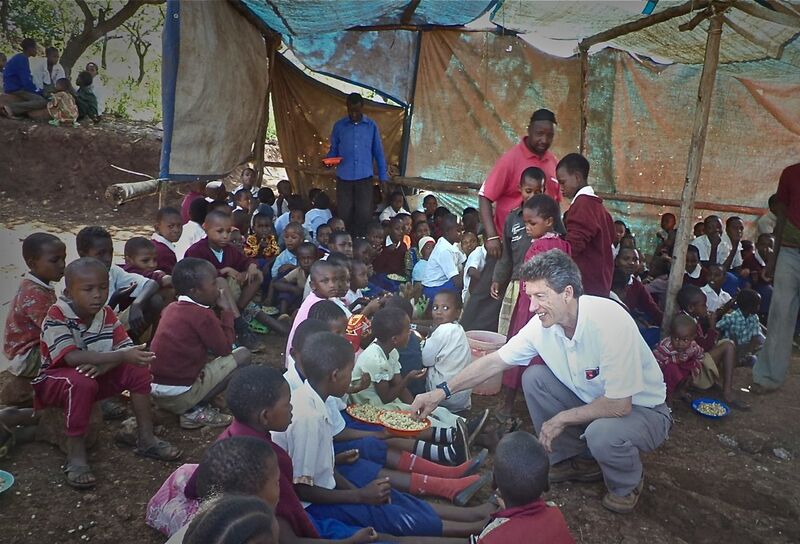 I was very disappointed that we had built the Dining Hall 8 months ago, but it had yet to offer a single meal to the kids. Apparently our school, because it is not yet “complete”, is not eligible for the WFP (World Food Program) food supply that is enjoyed by other schools in the District. “Not bad”, I said, smiling in appreciation. Regarding the lack of school supplies, I reminded myself to check our funds on my return to see how we can help. It would be nice to find a donor back in Canada who could take on each of our schools as their personal funding project for school supplies. After a few quick speeches, we proceeded to the new building that would house two more teacher families and had the usual photo shoot and ribbon cutting below the wall mounted plaque bearing the names of the donors; the “John and Judy Lutes Teacher Residences”. (Thank you John and Judy). I had increased the size of these residences over the first two after feedback from Sarah and her husband Mark that it felt a little too cramped. After chatting with the VIP’s a little, I excused myself to catch Sarah before she disappeared into her home at the first teacher residence building. I had a surprise for her. She insisted on inviting me in, and before I could tell her anything she was offering me a plate of beans and maize kernels. “This is my tradition”, she said firmly, “You must accept some food before you leave.” I had just had a large breakfast and was not hungry in the least, but managed to indulge her custom with a smile. “Sarah, guess what?” I asked. She shrugged. She grinned in excitement, “Ahsante sana, safi sana,”. 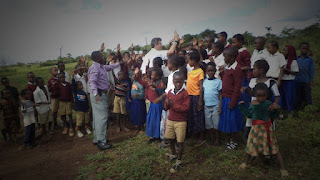 Before leaving, Sarah and I and a handful of children played a laughter-filled game of volleyball in the adjacent “sports field” with one of the footballs I had donated last week. The makeshift net was a flimsy piece of fabric held up by a couple of spindly poles, and the grass was over a foot and a half long (which is why they are not playing soccer instead), but the enthusiasm and laughter certainly wasn’t lacking. This was such a treat and a new experience for most of these kids. 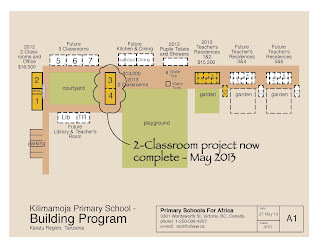 Off we go to the Kilimamoja site to open the new building for Classrooms 3 and 4. 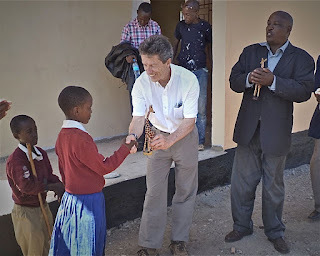 The exhaustion of the long bone-rattling road to the Kilimamoja site always disappears when we turn that last corner and view the school buildings nestled against the far hillside of the valley. And there we could see specks of colour, the hundred or so colorfully dressed villagers, having arrived at the celebrations straight from church. Mayor Winner refused our suggestion to keep this celebration low-profile. I was concerned for their time, energy and funding. But nothing doing - they pulled out the stops yet again for this building. A few hundred meters from the site I could see a group of children start to descend towards us, no doubt to sing a greeting. “Mathew,” I said, “Let’s park and walk”. Again, as in the past; we were surrounded by children singing, women chanting, giving handfuls of plantings to traditionally signify future crop success, and then leading us to a canopied area adjacent the new building for the speechmaking and gift exchanges. 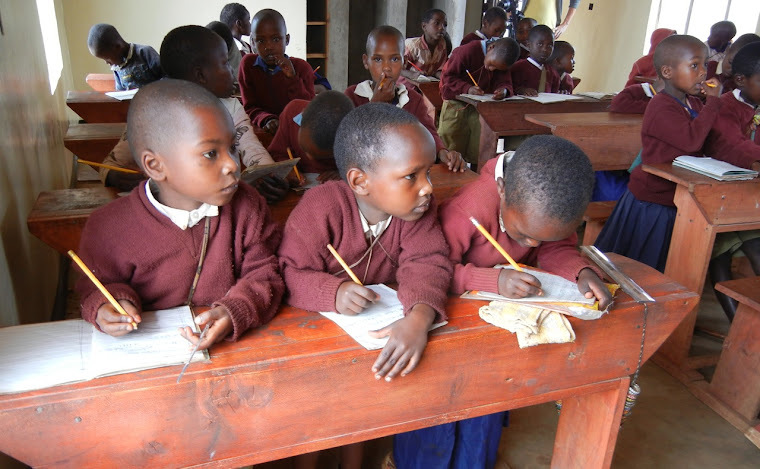 The government VIP’s gave the usual speeches, stressing the importance of education. 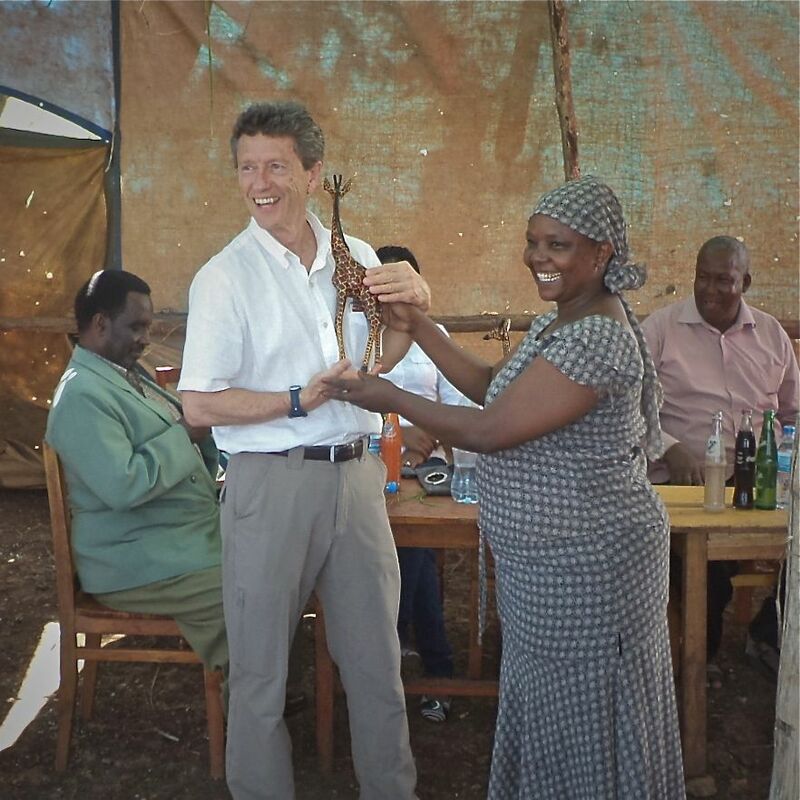 I stumbled through my typical Swahili offerings, and we exchanged my soccer balls for a couple of “twigas” (carved giraffe sculptures for the donor). 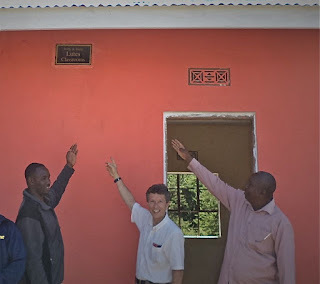 As at Gongali, we organized the ribbon-cutting and photo shoot under the donor plaque on the building, bearing the names of the same donors, the “John and Judy Lutes Classrooms”. (Thank you again, John and Judy, for your wonderful generosity). The VIP party then had a large meal in one of the classrooms, while the hundred or so children and parents ate their traditional ugali and bean meal under the welcoming shade of the canopy. 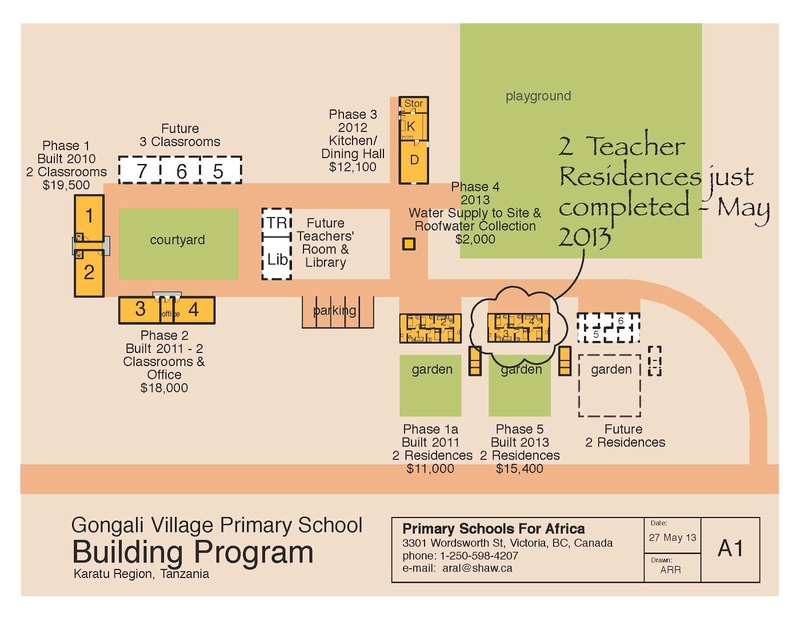 We walked the site afterwards, discussing the next phases of construction, either the Kitchen/Dining Hall, or Classrooms 5,6 and 7. 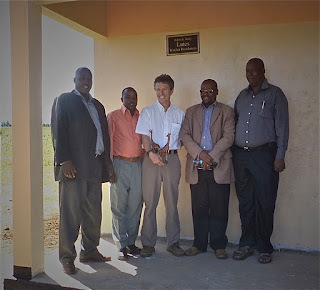 At the Teacher residence building (yet unoccupied) District Education Officer Sepeku then began a lively discussion with Lazarus about a septic system to be built and funded by the District. 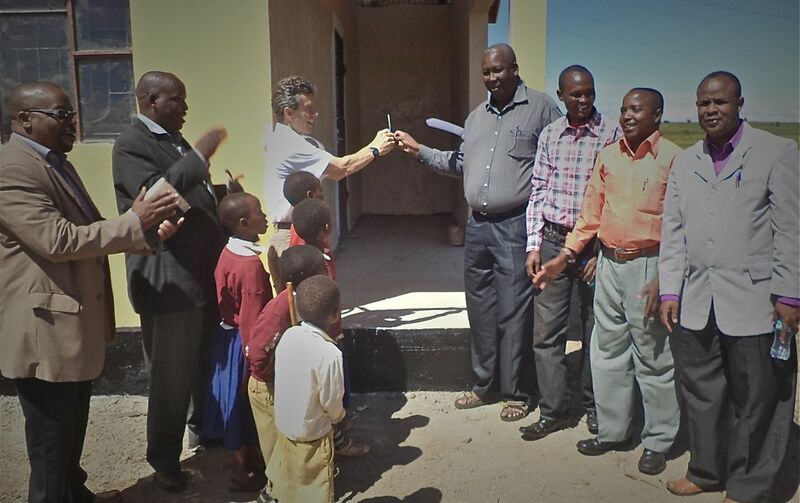 We had a standing agreement that we build the buildings; the district builds the toilets. 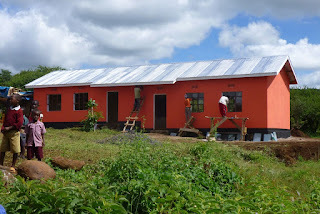 With their new thinking though, each residence would not only have a separate toilet and shower room building behind their residence, but each would drain into a proper concrete lined septic tank and all connected to a larger septic tank that could be pumped out. Great news, I thought. 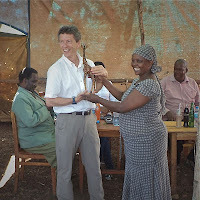 Mathew and I drove back to our lodging at the Tanzanice Farm, satisfied that all was going well with our projects, and enthusiastic about our future projects. I just have to make sure the fundraising work continues on the home front, and that we continue to attract donors to become sympathetic to the overwhelming need for more schools in Tanzania. 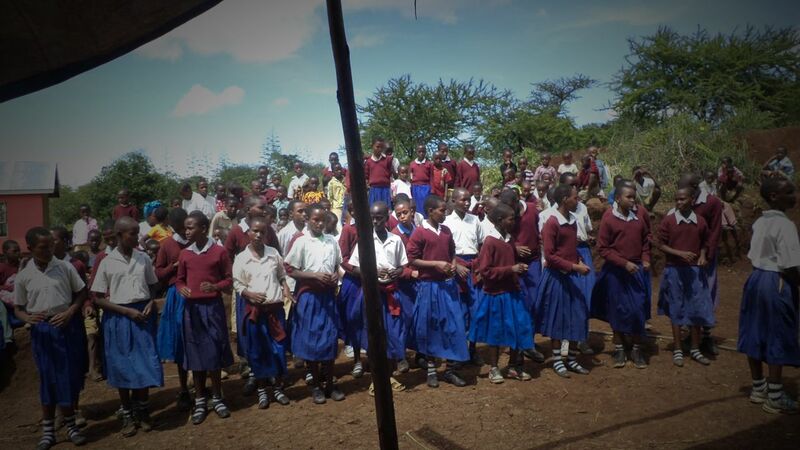 So many children here in the rural areas are still growing up without attending one.